Only U.S. state flag to have flown over a kingdom, a territory, a republic, and a state. Captain Vancouver established a UK-Hawaii friendship in 1793-4 and obtained a "cession" of the Islands to the UK, but the British government apparently never took notice of it. He gave a red ensign to the king then, which on later visits he found flying in places of honor. During the War of 1812, an American asked why the King (this was Kamehameha) was flying the "enemy" flag. He lowered it and raised the U.S. Flag, only to have the same thing happen when a British ship put into port. To avoid trouble, they decided to combine the two flags into one. A captain Adams (British) apparently helped design this flag for the king. Some scholars credit a Captain Beckley, however. The number of stripes varied, but was standardized at eight after 1843, for the eight principal islands in the group. In 1843 the UK declared that Hawaii was definitely independent and the Hawaiian flag was raised in a ceremony. However, this flag had stripes in the order white-red-blue through some mistake, which is why it is that way today, not red-white-blue as was originally done. I don't know if this is (or was) Standard Operating Procedure, but the British did confiscate all Hawaiian flags and burned them in 1843. This was the reason for the Hawaiian "revolt" which led to a British withdrawal in July (or so says a book I have on Hawaiian history). The "revolt" consisted of the total ignoring of the presence of the British by the Hawaiians. No talking, no notice, no nothing. Actually, the occupation was not sanctioned by London and Feb to July is how long it took word to go to London and back again. But the Hawaiians say they defeated the British by ignoring them! "At the opening of the Legislative Council, May 25, 1845, the new national banner was unfurled, differing little however from the former. It is octo (eight) parted per fess (horizontal band), first, fourth and seventh, argent (silver represented by the color white): second, fifth and eighth, gules (the color red): third and sixth, azure (light purplish blue), for the eight islands under one sovereign, indicated by crosses saltire, of St. Andrew and St. Patrick quarterly, per saltire counter changed, argent (white) and gules (red)." The Hawaiian flag previous to 1845 differed only in the amount of stripes, which was formerly "seven", and also the arranging of the colors. Previous to 1845 the white stripe was at the bottom instead of the present position of at the top. The person accredited with the designing of the new flag, which was unfurled before the 1845 Legislative Assembly, was Captain Hunt of H.B.M.S. (Her British Majesty's Ship) Baselisk. The Union Jack represented the friendly relationship between England and Hawai'i, and also noting that it was England and France that formally recognized the Hawaiian Kingdom as an Independent State and admitted her into the Family of Nations on November 28, 1843." Unfortunately, they don't give any further source citation for this than the name and date noted above. Not that Capt. Hunt is credited with the design of the new (and current) flag, which doesn't preclude the traditional association of the earlier design with King Kamehameha I.
Meyer's Konversations-Lexikon of 1897 had a different version of the Hawaiian flag. The Union Jack is smaller, the height corresponding only to three stripes instead of four. I am guessing that this is simply an erroneous illustration as I have seen several photographs of Hawaii's flag from the 1890's and the Hawaiian flags in all of the photos are pretty much what we know as today's Hawaiian state flag. I lived in Haleiwa as a kid and there was once a big colonial type resort near town. I have seen a picture of the resort taken in the late 1890's showing the US and Hawaiian flag flying prominently over the main building. Both flags appear to be between 10x15 feet and 15x25 feet. I think this flag is illustrated in Whitney Smith's state flag book. Nicholson's 1832 Code of Signals for New South Wales shows a flag for the Sandwich Islands, the name Cook gave to Hawaii, under Proposed Miscellaneous Flags for N.S.Wales and the South Seas. It has four red and three white stripes with the Union resting on the second white stripe. Siebmacher's 1876 Flaggen has a similar flag for Sandwichs Inseln, but with a fourth white stripe at the top, and also a flag for Hawaische Inseln. This has w/r/b/w/r/b/w/r with the bottom of the Union overlapping two thirds of the second white stripe. 1837 The Flags of the Principal Nations in the World issued in Philadelphia USA R.N.Barnes shows w/b/r w/b/r w/b/r nine stripes with the Union on the second red. The Wikipedia article at en.wikipedia.org/wiki/Flag_of_Hawaii shows the flag of the Hawaii Governor from the pre-1959 period. The Hawaii Territorial Governor's Flag is a horizontal bicolor, very dark blue (B++) over dark red (R+) with eight equal distance white stars. The stars represent the main islands of the Hawaii State. This flag was designed by an adjutant general of the Territorial Governor. The Hawaiian Crown flag of King Kamehameha III 1833, said to be first flag of the Monarchy which hung at the Kings home in Nuuanu, Oahu. The flag is one sided, center is hand sewn; one (blue) strip is torn. Flag was kept in a family of the kings and has never been revealed. Flag dimensions 6 feet by 17 feet. Flag was listed for sale on EBay by Kahanamoku Estate Foundation. At point of identification on EBay, it was listed at $900,000. This flag is from the book "Flags to Color, Washington to Lincoln," and is on page 30. It's listed as "Kuhina Nui's flag, 1850s." "Colors: Crown, letters, comma and period red; field white." "Hawaii is the only part of the United States which was previously a separate monarchy. 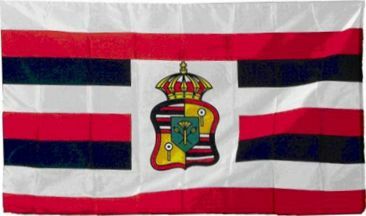 In the 1850s one of the important advisors to the king was the Kuhina Nui; her flag is shown here and incorporates the distinctive royal crown of Hawaii. American settlers overthrew the monarchy in 1893 in the hope that the islands would be annexed by the United States, but this did not happen until 1898 when concern was raised about way-stations for ships heading to newly acquired territories in the Far East." A flag like this, but with a white field only, is described and shown at kaiwakiloumoku.ksbe.edu/makalii/royalstandard.php. The Royal Standard of King Kalākaua was displayed in 1881. I had purchased a flag from a retail store located in Honolulu, Oahu, Hawaii. The store merchant indicated that the flag unofficially represented the Hawaiian Monarchy and was displayed during the rule of King David Kalakaua who reigned over the Kingdom of Hawaii from February 12, 1874 until his death on January 20,1891. When I visited Honolulu Hawaii last month I found a photo of Queen Liliuokalani's Royal Standard in a book on the Hawaii Kingdom (History of the Hawaiian Kingdom by Norris W. Potter, Lawrence M. Kasdon and Ann Rayson (Apr 2003)). The flag is not 1:2 but 7:10.5 in proportion. Her flag is the Hawaii Kingdom flag with her emblem of a crown and yellow shield having her initial and motto of ONIPAA in red in the fly. They say ONIPAA means Straight Forward. The Kanaka Maoli flag has green, red, yellow stripes. At the center of the flag is a green ornamental, protective shield that bears the coat of arms that is composed of a Kahili in front of two crossed, pointed paddles. A copy of this flag can be viewed at the.honoluluadvertiser.com/2001/Feb/12/212localnews29.html. It is alleged to predate the current red/white/blue Kingdom of Hawaii, later State of Hawaii, flag. "The Kanaka Maoli - or "native Hawaiian" - flag is said to have been Kamehameha's personal flag long before the modern Hawaiian flag. British navy Captain Lord George Paulet destroyed it when he took control of Hawaii for five months in 1843. At the flag's center is a green shield bearing a coat of arms, which include a kahili, the original Hawaiian royal standard, and two paddles, meant to represent the voyaging tradition of the Native Hawaiians. The flag's color scheme is red, yellow and green, meant to represent different groups within Hawaiian society. The yellow is symbolic of the alii, the powerful royal class. Red represents the konohiki, the landed caste that served the alii. Green signifies the makaainana, or commoners. You may have noticed the Kanaka Maoli flag on recent trips to the islands. It has become popular in the community in recent years and can be found on everything from t-shirts to bumper stickers." The information given above seems to come from "The Honolulu Advertiser", 12 February 2001, in which Yasmin Anwar describes the "resurrection" of the "original flag". This source is given above but not developed. Since "Hawai'i Today" shows an image of the flag that resembles a lot the image above, they probably also import material from the original article via FOTW. Therefore, it seems better to develop the original source, "The Honolulu Advertiser", than its sequel, in the FOTW website. "Gene Simeona of Honolulu [...] says he's resurrected the 'original' Hawaiian green, red and yellow striped flag, destroyed by British navy Capt. Lord George Paulet when he seized Hawai'i for five months in 1843. To Simeona, his newly unearthed flag says, "We are not British. We are kanaka maoli." Simeona says he ran into a descendant of Lord Paulet on the grounds of 'Iolani Palace in 1999 who told him the present Hawaiian flag is not the original. That provoked Simeona to scour the Hawai'i State Archives, where he found the design, then reproduced it. Since then, he and his business partner Stan Fonseca have been churning the emblem out in hopes that it'll catch on as a fresh, non-colonial symbol of the restored Hawaiian kingdom. According to Fonseca, the green in the flag represents the maka'ainana (commoner) caste, the land and goodness; the red represents the landed konohiki who served the ali'i, genealogy and strength; and the yellow represents the ali'i, spirituality and alertness to danger. At the center of the flag is a green shield bearing a coat of arms of the kanaka maoli, made up of kahili and crossed, pointed paddles that represent the voyaging history of Hawaiians. Anna Marie Kahunahana, founder of A Call for Unity, which seeks to restore the independent Hawaiian nation, wholeheartedly endorses the flag. "It represents who we are as a people and a nation," she said. Others aren't so sure about the design. "I had it up for a while, but I took it down. It's too reggae for me," said Aopohakuku Rodenhurst of the Nation of Ku spiritual group. Still, Simeona and Fonseca are selling and giving away the flags faster than they can make them. On Feb. 25, they will fly the "Hawaiian people's flag" on the grounds of 'Iolani Palace to commemorate "the crime" of Paulet's fleeting takeover of Hawai'i. "Please leave your Union Jacks at home," said a recent notice announcing the event in the Hawaiian News. Kekuni Blaisdell, a physician and leader of the independence group Ka Pakaukau, said perhaps it's time for a flag that is void of colonial symbols. But others say Hawaiians shouldn't be in a rush to embrace the new flag without establishing its authenticity. Peter Umialiloa Sai, a spokesman for the Council of Regency of the Hawaiian Kingdom, says when his organization first learned about Simeona's flag a year ago, they conducted research to try to pinpoint its origin, but found no clues. In the meantime, Sai said, they amassed extensive documentation validating the traditional Hawaiian flag as the official emblem of the former Hawaiian kingdom. At NAVA 47 in Salt Lake City Hawaiian flag scholar Patrick Ka'ano'i presented evidence debunking the Kanaka Maoli (native Hawaiian) flag which is said to have been Kamehameha's personal flag long before the modern Hawaiian flag. According to this controversial story, British Navy Captain Lord George Paulet destroyed it when he took control of Hawaii for five months in 1843. However, the popular Kanaka Maoli flag appears to be a modern commercial invention hoping to appeal to those supporting a modern Hawaiian sovereignty movement. The Kanaka Maoli Flag was created in 2001 by Gene Simeona and produced by his business partner Stan Fonseca. There is no historical evidence of the flags existence before this time. A long and detailed article on the flag of the Kingdom (and now State) of Hawaii was published in Crux Australis Volume 25.1 No 101 January-March 2011. The flag that Paulet confiscated was the red, white and blue striped Hawaiian flag devised around 1816 for Kamehameha I and of which the modern US State flag is directly descended.